The 2016 World Food Prize (WFP), the prestigious prize for agricultural research, celebrated four recipients on their achievement with the pro-vitamin A (pVA) biofortified sweet potato to combat Vitamin A Deficiency (VAD) [1World Food Prize 2016 World Food Prize Laureates; Andrade, Mwanga, Low and Bouis: World Food Prize 2016. [updated 2016 Oct]. Internet. Available from: https://www.worldfoodprize.org/en/laureates/2016__andrade_mwanga_low_and_bouis/]. According to WFP, nearly two million households across ten African countries are currently planting or purchasing this sweet potato. In comparison, Golden Rice (GR), the most well-known pVA biofortified crop, still grapples with regulatory approvals and public skepticism for its release. The GR project, initiated in the 1990's with humanitarian concerns, aims at achieving the same goal as the sweet potato. A critical difference, however, in the two crops’ divergent fate is how they are created, i.e., conventional breeding for the sweet potato and transgenic technologies for GR. Vitamin A deficiency is a major public health issue especially among preschool-aged children in developing countries. It affects about 190 million of those children, and estimated 6.9 million die annually due to VAD by the age of five [2World Health Organization Vitamin A supplementation in infants and children 6-59 months of age: World Health Organization 2016. Available from: http://www.who.int/elena/titles/vitamina_children/en/]. With serum retinol lower than 0.7 μML-1 which defines VAD, the estimated prevalence of VAD was 29% in 2013 among children aged 6 to 59 months, with the highest rates in Sub-Saharan African countries ranging from 25% to 75%, and South Asian 13% to 79% [3Stevens GA, Bennett JE, Hennocq Q, et al. Trends and mortality effects of vitamin A deficiency in children in 138 low-income and middle-income countries between 1991 and 2013: A pooled analysis of population-based surveys. Lancet Glob Health 2015; 3(9): e528-36. [http://dx.doi.org/10.1016/S2214-109X(15)00039-X] [PMID: 26275329] ]. Vitamin A is required for normal functioning of the visual system, maintenance of cell function for growth, epithelial integrity, immunity, and reproduction. Vitamin A deficiency, thus, increases vulnerability to a range of illnesses including diarrhea, measles, and respiratory infections [4West K Jr. Vitamin A deficiency: Health, survival, and vision. New York: Oxford University Press 1996.] consequently leading to higher mortality [5Abraham A. Toward a workable biosafety system for regulating genetically modified organisms in Ethiopia: Balancing conservation and competitiveness. GM Crops Food 2013; 4(1): 28-35. [http://dx.doi.org/10.4161/gmcr.24375] [PMID: 23580251] ]. Accordingly, international and national entities have implemented policy and behavior interventions to combat VAD. Policy interventions include Vitamin A Supplementation (VAS) and food fortification while behavior interventions focus on individual knowledge and practices for VA rich diets [6Mbabazi R. Molecular characterisation and carotenoid quantification of pro-vitamin A biofortified genetically modified bananas in Uganda 2015.]. The 1992 International Conference on Nutrition, which called for VAD elimination, facilitated urgent VAS implantation. Many countries have since integrated periodic VAS to children in their national health programs [2World Health Organization Vitamin A supplementation in infants and children 6-59 months of age: World Health Organization 2016. Available from: http://www.who.int/elena/titles/vitamina_children/en/]. Currently, the United Nations Children's Fund (UNICEF), the VAS flagship organization, supports national-level VAS programs in its 82 priority countries as a child survival intervention. In 2014, 69% of the target children in the priority countries received VAS compared to 30% in 2000 [7Vitamin A Supplementation: A Statistical Snapshot. New York: United Nations Children's Fund 2016.]. However, VAS programs may depend on compliant behaviors, consistent funding from the government or international donors, and accessible national healthcare distribution channels to target populations [8Kuong K, Laillou A, Chea C, Chamnan C, Berger J, Wieringa FT. Stability of vitamin A, iron and zinc in fortified rice during storage and its impact on future national standards and ProgramsCase study in Cambodia. Nutrients 2016; 8(1): 51. Other interventions to alleviate VAD are more food-based, including promotion of dietary diversification, food fortification, and biofortification. A diversified diet including animal-origin foods rich in VA might satisfy VA daily requirements. However, in many developing countries, diets are mainly based on cereals and legumes that are lacking or low in VA. Moreover, some readily available vegetables have low VA bioavailability [9Dary O, Mora JO. Food fortification to reduce vitamin A deficiency: International vitamin A consultative group recommendations. J Nutr 2002; 132(9 Suppl): 2927S-33S. [PMID: 12221271] ]; for instance, raw green leafy vegetables rank the lowest in the VA bioavailability pyramid [10Underwood BA. Dietary approaches to the control of vitamin A deficiency: An introduction and overview. Food Nutr Bull 2000; 21(2): 117-23. [http://dx.doi.org/10.1177/156482650002100202] ]. Dietary diversification depends little on external funding or healthcare systems, yet often it is difficult to change established dietary behaviors. Therefore, rapid impacts from dietary diversification on VAD are less likely achievable in a short period [8Kuong K, Laillou A, Chea C, Chamnan C, Berger J, Wieringa FT. Stability of vitamin A, iron and zinc in fortified rice during storage and its impact on future national standards and ProgramsCase study in Cambodia. Nutrients 2016; 8(1): 51. [http://dx.doi.org/10.3390/nu8010051] [PMID: 26784227] ]. Food fortification, which is fortifying processed foods such as table sugar, cooking oil or cereal flour with VA, is another VAD intervention strategy [11Tanumihardjo SA, Gannon B, Kaliwile C. Controversy Regarding Widespread Vitamin A Fortification in Africa and Asia. Adv Nutr Int Rev J 2016; 7(1): 5A-A.]. A successful example is VA-fortified sugar which decreased VAD across target populations in Guatemala [12Arroyave G, Mejía LA, Aguilar JR. The effect of vitamin A fortification of sugar on the serum vitamin A levels of preschool Guatemalan children: A longitudinal evaluation. Am J Clin Nutr 1981; 34(1): 41-9. [PMID: 7446457] , 13Pineda O. Fortification of sugar with vitamin A. Food Nutr Bull 1998; 19(2): 131-6. [http://dx.doi.org/10.1177/156482659801900207] ]. For effective food fortification, good vehicle foods for target nutrients should be available and widely consumed. Also, the nutrient in the vehicle must be stable under normal conditions of storage and usage [13Pineda O. Fortification of sugar with vitamin A. Food Nutr Bull 1998; 19(2): 131-6. [http://dx.doi.org/10.1177/156482659801900207] ]. For instance, VA fortified rice was estimated less effective in Cambodia where rice provides 70% of the daily energy intake because of up to 93% loss of fortified VA, depending on the fortification methods and storage conditions [8Kuong K, Laillou A, Chea C, Chamnan C, Berger J, Wieringa FT. Stability of vitamin A, iron and zinc in fortified rice during storage and its impact on future national standards and ProgramsCase study in Cambodia. Nutrients 2016; 8(1): 51. [http://dx.doi.org/10.3390/nu8010051] [PMID: 26784227] ]. Centralized processing facilities are also needed with regulatory frameworks in place to minimize trading conflicts and monitoring issues [12Arroyave G, Mejía LA, Aguilar JR. The effect of vitamin A fortification of sugar on the serum vitamin A levels of preschool Guatemalan children: A longitudinal evaluation. Am J Clin Nutr 1981; 34(1): 41-9. [PMID: 7446457] ]. However, many developing countries do not have the food industry sufficiently developed for centralized fortification, and national fortification programs are often subject to political priorities [10Underwood BA. Dietary approaches to the control of vitamin A deficiency: An introduction and overview. Food Nutr Bull 2000; 21(2): 117-23. [http://dx.doi.org/10.1177/156482650002100202] ]. Biofortification differs from food fortification by aiming to increase crop nutrient levels during crop growth, not through crop processing. Biofortification can be achieved by applying nutrient-rich fertilizers to facilitate micronutrient accumulation in edible parts, conventional breeding by creating elite hybrids with enhanced target nutrients, and transgenic methods to obtain specific nutritional traits from donor organisms [2World Health Organization Vitamin A supplementation in infants and children 6-59 months of age: World Health Organization 2016. Available from: http://www.who.int/elena/titles/vitamina_children/en/]. In recent decades, biofortification has targeted three globally important micronutrients: iron, zinc and pVA. While transgenic methods are touted advantageous over conventional breeding in that they could transfer specific traits to target crops with precision in shorter time periods [14Garcia Casal MN, Peñ Rosas JP, Pachón H, De Regil LM, Centeno Tablante E, Flores Urrutia MC. Staple crops biofortified with increased micronutrient content: effects on vitamin and mineral status, as well as health and cognitive function in the general population. Cochrane Database of Syst Rev; Cochrane Libr 2016; 8: CD012311. ], safety issues on human and the environment hinder their wide acceptance. Other than VA delivery mechanisms of those interventions, the form of VA also differs. VAS uses Retinyl Palmitate (RP), retinyl acetate or retinol, and RP is the most commercially available VA form [15Souganidis E, Laillou A, Leyvraz M, Moench-Pfanner R. A comparison of retinyl palmitate and red palm oil β-carotene as strategies to address Vitamin A deficiency. Nutrients 2013; 5(8): 3257-71. [http://dx.doi.org/10.3390/nu5083257] [PMID: 23955382] ]. These chemicals are typically diluted in vegetable oil with vitamin E [16Masanja H, Smith ER, Muhihi A, et al. Effect of neonatal vitamin A supplementation on mortality in infants in Tanzania (Neovita): A randomised, double-blind, placebo-controlled trial. Lancet 2015; 385(9975): 1324-32. [http://dx.doi.org/10.1016/S0140-6736(14)61731-1] [PMID: 25499543] ], and this oil-based VA solution is orally delivered in soft gelatin capsules [17World Health Organization Guideline: Vitamin A supplementation in infants and children 6-59 months of age Geneva: World Health Organization. 2011. Report No. : 9241501766.]. The oil matrix protects VA during storage, improves stability, and facilitates absorption in the gastrointestinal tract [15Souganidis E, Laillou A, Leyvraz M, Moench-Pfanner R. A comparison of retinyl palmitate and red palm oil β-carotene as strategies to address Vitamin A deficiency. Nutrients 2013; 5(8): 3257-71. [http://dx.doi.org/10.3390/nu5083257] [PMID: 23955382] ]. Likewise, food fortification widely utilizes RP although RP’s efficacy in fortified foods might vary depending on food vehicles and storage conditions [18Pignitter M, Hernler N, Zaunschirm M, et al. Evaluation of palm oil as a suitable vegetable oil for vitamin A fortification programs. Nutrients 2016; 8(6): 378. [http://dx.doi.org/10.3390/nu8060378] [PMID: 27338464] , 19Pignitter M, Dumhart B, Gartner S, et al. Vitamin A is rapidly degraded in retinyl palmitate-fortified soybean oil stored under household conditions. J Agric Food Chem 2014; 62(30): 7559-66. [http://dx.doi.org/10.1021/jf502109j] [PMID: 25003735] ]. While the VAs are well absorbed in the body, adverse effects on health were indicated if consumed in large amounts [20Haskell MJ. The challenge to reach nutritional adequacy for vitamin A: β-carotene bioavailability and conversion-evidence in humans. Am J Clin Nutr 2012; 96(5): 1193S-203S. [http://dx.doi.org/10.3945/ajcn.112.034850] [PMID: 23053560] ]. The VA form of biofortification is pVA carotenoids which plants produce naturally for multiple functions [21Wang C, Zeng J, Li Y, et al. Enrichment of provitamin A content in wheat (Triticum aestivum L.) by introduction of the bacterial carotenoid biosynthetic genes CrtB and CrtI. J Exp Bot 2014; 65(9): 2545-56. [http://dx.doi.org/10.1093/jxb/eru138] [PMID: 24692648] ]. Of the carotenoids, β-carotene has the highest pVA activity due to its two unsubstituted β-rings. Plant β-carotene is considered safe because its intestinal conversion to retinal for absorption decreases with increased β-carotene [20Haskell MJ. The challenge to reach nutritional adequacy for vitamin A: β-carotene bioavailability and conversion-evidence in humans. Am J Clin Nutr 2012; 96(5): 1193S-203S. [http://dx.doi.org/10.3945/ajcn.112.034850] [PMID: 23053560] ]. Yet, its bioconversion rate varies with food matrix, or chemical relationships between the nutrient and non-nutrient components of food [22United States Department of Agriculture National Agricultural Library. Search Thesaurus USDA National Agricultural Library; [updated 2016 Oct]. Internet. Available from: http://agclass.nal.usda.gov/mtwdk.exe?k=default&l=60&n=1&s=5&t=2&w=17240 ], food preparation techniques and amount of fat [20Haskell MJ. The challenge to reach nutritional adequacy for vitamin A: β-carotene bioavailability and conversion-evidence in humans. Am J Clin Nutr 2012; 96(5): 1193S-203S. [http://dx.doi.org/10.3945/ajcn.112.034850] [PMID: 23053560] ]. Recently, Bechoff and Dhuique-Mayer (2016) indicated human factors such as nutritional status, genetic factors, and diseases that need to be investigated for their influence on biofortified pVA, as well as dietary factors [23Bechoff A, Dhuique-Mayer C. Factors influencing micronutrient bioavailability in biofortified crops. Ann N Y Acad Sci 2017; 1390(1): 74-87. This paper covers VAD issues from three angles. The first part briefly discusses VAS and arguments around it, which partly triggered a paradigm shift towards food-based approaches to better combat VAD. The second part updates the status of transgenic pVA crops as a food-based intervention. Few VAD interventions perhaps have invited more debates than transgenic biofortification due to controversies on Genetically Modified Organisms (GMOs). The third part discusses political climates for adopting transgenic pVA crops, and presents a framework for transgenic pVA crop development. According to the World Health Organization (WHO), oral provision of high-dose VA every 6 months until the age of five is grounded on that a single, large dose of VA is well absorbed and stored in the liver, and mobilized as needed over an extended period of time [17World Health Organization Guideline: Vitamin A supplementation in infants and children 6-59 months of age Geneva: World Health Organization. 2011. Report No. : 9241501766.]. This scheme is considered effective, swift and inexpensive for developing countries as it does not require a sterile injectable preparation [24Johns Hopkins Bloomberg School of Public Health The Story of Vitamin A: Johns Hopkins Bloomberg School of Public Health 2003. [updated 2016 Sep. Internet]. Available from: http://www.jhsph.edu/news/stories/2003/sommer-vita.html.]. WHO recommends a dose of 100,000 International Units (IU) in infants aged 6-11 months and 200,000 IU in children aged 12-59 months for adequate protection up to 6 months [17World Health Organization Guideline: Vitamin A supplementation in infants and children 6-59 months of age Geneva: World Health Organization. 2011. Report No. : 9241501766.]. On a per-child basis, VAS can be a low-cost intervention; each VA gelatin capsule costs approximately US$ 0.02 with an estimated annual delivery cost of US$ 1-2 per child [17World Health Organization Guideline: Vitamin A supplementation in infants and children 6-59 months of age Geneva: World Health Organization. 2011. Report No. : 9241501766.]. The evidential ground for the WHO recommendations largely came from the studies conducted during the 1980's, which found a direct relationship between VAS and reduced child morbidity and mortality [17World Health Organization Guideline: Vitamin A supplementation in infants and children 6-59 months of age Geneva: World Health Organization. 2011. Report No. : 9241501766.]. One of the landmark studies, conducted in Indonesia, associated VAD with excess mortality in children suffering mild xerophthalmia [25Sommer A, Tarwotjo I, Hussaini G, Susanto D. Increased mortality in children with mild vitamin A deficiency. Lancet 1983; 2(8350): 585-8. [http://dx.doi.org/10.1016/S0140-6736(83)90677-3] [PMID: 6136744] ]. The findings indicated mild xerophthalmia might justify community-wide interventions to prevent blindness and reduce child mortality [25Sommer A, Tarwotjo I, Hussaini G, Susanto D. Increased mortality in children with mild vitamin A deficiency. Lancet 1983; 2(8350): 585-8. [http://dx.doi.org/10.1016/S0140-6736(83)90677-3] [PMID: 6136744] ]. Following this association, 200,000 IU VA capsules were distributed to preschool-aged children twice a year in 450 Indonesian villages, and the authors found VAS could decrease child mortality by 34%, compared to the control [26Sommer A, Tarwotjo I, Djunaedi E, et al. Impact of vitamin A supplementation on childhood mortality. A randomised controlled community trial. Lancet 1986; 1(8491): 1169-73. [http://dx.doi.org/10.1016/S0140-6736(86)91157-8] [PMID: 2871418] ]. When the 34% reduction in child mortality was interpreted for formulating intervention policy, VAS became part of a child survival measure [27Solomons NW. Will universal periodic vitamin A supplementation ever reach retirement age? Food Nutr Bull 2014; 35(2): 200-2. [http://dx.doi.org/10.1177/156482651403500206] [PMID: 25076767] ]. For child morbidity, a meta-analysis showed VAS effects varied depending on diseases in children aged 6-59 months; VAS significantly reduced incidence of diarrhea and measles while not significant on respiratory diseases [28Imdad A, Herzer K, Mayo-Wilson E, Yakoob MY, Bhutta ZA. Vitamin A supplementation for preventing morbidity and mortality in children from 6 months to 5 years of age. Cochrane Database Syst Rev 2010; (12): CD008524. [PMID: 21154399] ]. This study mentioned reductions in diarrhea and measles could be a potential pathway to reducing all-cause child mortality. However, the authors cautioned levels of evidence and quality of the analyzed studies ranged from moderate to very low, indicating difficulties in separately studying child morbidity from VAD [28Imdad A, Herzer K, Mayo-Wilson E, Yakoob MY, Bhutta ZA. Vitamin A supplementation for preventing morbidity and mortality in children from 6 months to 5 years of age. Cochrane Database Syst Rev 2010; (12): CD008524. Some studies, however, questioned VAS’ effectiveness in reducing child mortality. For instance, Awasthi et al. (2013) evaluated the periodic 200,000 IU VA capsule delivery on child mortality over five years in India [29Awasthi S, Peto R, Read S, Clark S, Pande V, Bundy D. Vitamin A supplementation every 6 months with retinol in 1 million pre-school children in north India: DEVTA, a cluster-randomised trial. Lancet 2013; 381(9876): 1469-77. [http://dx.doi.org/10.1016/S0140-6736(12)62125-4] [PMID: 23498849] ]. Their mortality ratio between the VAS and control group was 0.96 with 95% confidence interval (CI) 0.89-1.03 and p-value 0.22. Their results did not support the expected 20-30% reduction in child mortality with VAS [29Awasthi S, Peto R, Read S, Clark S, Pande V, Bundy D. Vitamin A supplementation every 6 months with retinol in 1 million pre-school children in north India: DEVTA, a cluster-randomised trial. Lancet 2013; 381(9876): 1469-77. [http://dx.doi.org/10.1016/S0140-6736(12)62125-4] [PMID: 23498849] ]. Substantial interest in VAS during the neonatal period also exists. Neonatal VAS (within the first 28 days after birth) was proposed to improve infant survival by increased VA body storage. Presently, WHO does not recommend neonatal VAS due to conflicting evidence on neonatal mortality [30Organization WH. Guideline: Neonatal vitamin A supplementation. Geneva: World Health Organization 2011. ], which prompted large-scale trials for more conclusive evidence and better decision-making [16Masanja H, Smith ER, Muhihi A, et al. Effect of neonatal vitamin A supplementation on mortality in infants in Tanzania (Neovita): A randomised, double-blind, placebo-controlled trial. Lancet 2015; 385(9975): 1324-32. [http://dx.doi.org/10.1016/S0140-6736(14)61731-1] [PMID: 25499543] ]. With WHO funding, three large-scale randomized trials were conducted in Ghana, Tanzania and India to assess whether an oral dose of 50,000 IU VA to newborn infants reduced post-VAS mortality by at least 15% in the first six months of life [31Edmond KM, Newton S, Shannon C, et al. Effect of early neonatal vitamin A supplementation on mortality during infancy in Ghana (Neovita): A randomised, double-blind, placebo-controlled trial. Lancet 2015; 385(9975): 1315-23. [http://dx.doi.org/10.1016/S0140-6736(14)60880-1] [PMID: 25499545] ]. The three studies concluded that their findings did not support inclusion of newborn VAS as a child survival strategy. In Ghana, the Relative Risk Ratio (RRR) between the VAS and control group was 1.12 with 95% CI 0.95-1.33 and p-value 0.18 [31Edmond KM, Newton S, Shannon C, et al. Effect of early neonatal vitamin A supplementation on mortality during infancy in Ghana (Neovita): A randomised, double-blind, placebo-controlled trial. Lancet 2015; 385(9975): 1315-23. [http://dx.doi.org/10.1016/S0140-6736(14)60880-1] [PMID: 25499545] ]. In Tanzania, RRR was 1.10 with 95% CI 0.95-1.26 and p-value 0.19 [16Masanja H, Smith ER, Muhihi A, et al. Effect of neonatal vitamin A supplementation on mortality in infants in Tanzania (Neovita): A randomised, double-blind, placebo-controlled trial. Lancet 2015; 385(9975): 1324-32. [http://dx.doi.org/10.1016/S0140-6736(14)61731-1] [PMID: 25499543] ]. In India, RRR was 0.90 with 95% CI 0.81-1.0 and p-value 0.06 [32Mazumder S, Taneja S, Bhatia K, et al. Efficacy of early neonatal supplementation with vitamin A to reduce mortality in infancy in Haryana, India (Neovita): A randomised, double-blind, placebo-controlled trial. Lancet 2015; 385(9975): 1333-42. Despite extensive distribution of periodic VAS over the past 20 years, decrease in VAD has been stagnant; Mason et al. (2014) estimated an annual global improvement rate of VAD as 0.3 percentage points since 1990, and at this rate the authors argued it would take another 100 years to eliminate VAD [33Mason J, Greiner T, Shrimpton R, Sanders D, Yukich J. Vitamin A policies need rethinking. Int J Epidemiol 2015; 44(1): 283-92. [http://dx.doi.org/10.1093/ije/dyu194] [PMID: 25306559] ]. While criticizing VAS, Greiner (2013) endorsed food-based approaches for their reachability and safety to all community members, and promotion of self-sufficiency and food security [34Greiner T. Vitamin A: Moving the food-based approach forward. FAO and WHO 2013.]. He argued little emphasis on food-based approaches comes largely from political reasons as food-based programs are complex to implement and evaluate [34Greiner T. Vitamin A: Moving the food-based approach forward. FAO and WHO 2013.]. As a food-based approach, conventionally-bred pVA biofortified crops such as the sweet potato, cassava and maize have been released [35HarvestPlus HarvestPlus Crop Strategies: HarvestPlus leads a global effort 2016. Available from: http://www.harvestplus.org/sites/default/ files/HarvestPlus_CropStrategies_Brochure_April2015.pdf.]. However, no transgenic pVA biofortified crops are currently available despite significant scientific progress in various crops such as wheat, potato, maize, banana, tomato, canola as well as rice. 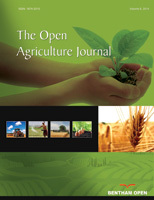 Some of the cited reasons for transgenic crop disapproval are their potential threats to human health through toxins or allergens, erosion of biodiversity via vertical or horizontal gene flows, new reliance of small-holder farmers on transgenic seed supply, and oversimplification of hunger and poverty issues in developing countries [36Stein AJ, Sachdev HP, Qaim M. Potential impact and cost-effectiveness of Golden Rice. Nat Biotechnol 2006; 24(10): 1200-1. [http://dx.doi.org/10.1038/nbt1006-1200b] [PMID: 17033649] ]. The next section updates the status of transgenic pVA crops as of November 2016. Four global crops, wheat, maize, potato and banana were selected for the updates. Fig. 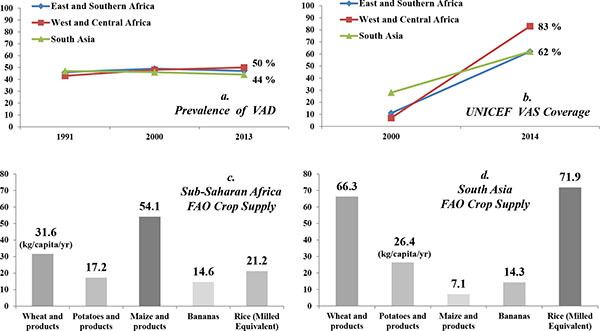 (1 ) shows changes in VAD prevalence and VAS coverage rates over time in Sub-Saharan Africa and South Asia, and annual per-capita crop supply to indicate crops’ relevance to each region. For instance, maize would be more important in Sub-Saharan Africa whereas rice and wheat in South Asia at a whole population level, not specifically for children due to data limitation. a) showing estimated prevalence of vitamin A deficiency in children aged 6 to 59 months by UNICEF regions [3Stevens GA, Bennett JE, Hennocq Q, et al. Trends and mortality effects of vitamin A deficiency in children in 138 low-income and middle-income countries between 1991 and 2013: A pooled analysis of population-based surveys. Lancet Glob Health 2015; 3(9): e528-36. [http://dx.doi.org/10.1016/S2214-109X(15)00039-X] [PMID: 26275329] ]; b) UNICEF vitamin A supplementation coverage rates [7Vitamin A Supplementation: A Statistical Snapshot. New York: United Nations Children's Fund 2016. ]; c) Food and Agriculture Organization (FAO)-estimated food supply quantities of five crops as kg/capita/yr in Sub-Saharan Africa; and d) South Asia. (FAO data: http://faostat3.fao.org/ download/FB/*/E ; For Sub-Saharan Africa, East, West, Mid and South African data were averaged to estimate Sub-Saharan data excluding North; 2011 was latest year available for data). Carotenoid biosynthesis pathway in plants, adopted and modified from Cunningham Jr et al. (1998) [37Cunningham FX Jr, Gantt E. Genes and enzymes of carotenoid biosynthesis in plants. Annu Rev Plant Physiol Plant Mol Biol 1998; 49(1): 557-83. For transgenic pVA enhancement in crops, identification of the carotenogenesis pathway and its regulating genes in plants and bacteria enabled ectopic expression of specific carotenoids in edible parts of crops [38Cong L, Wang C, Chen L, Liu H, Yang G, He G. Expression of phytoene synthase1 and carotene desaturase crtI genes result in an increase in the total carotenoids content in transgenic elite wheat (Triticum aestivum L.). J Agric Food Chem 2009; 57(18): 8652-60. [http://dx.doi.org/10.1021/jf9012218] [PMID: 19694433] ]. Briefly, carotenogenesis begins with the formation of geranylgeranyl-diphosphate (GGPP) followed by condensation of two GGPPs (Fig. 2 ). This produces a colorless carotene, phytoene with phytoene synthase (PSY). A series of desaturation reactions with phytoene desaturase and ζ-carotene desaturase leads to a colored lycopene, followed by subsequent cyclization reactions to yield carotenoids. Of the carotenoids, only β-carotene has a high pVA activity [39Al-Babili S, Beyer P. Golden Ricefive years on the roadfive years to go? Trends Plant Sci 2005; 10(12): 565-73. Three strategies can summarize transgenic production of pVA carotenoids. First, with the push strategy, genes encoding rate-limiting steps in the pVA biosynthetic pathway are inserted to produce carotenoids. Golden Rice is an example of this strategy with the multiple-genes inserted to produce β-carotene in rice endosperm [40Ye X, Al-Babili S, Klöti A, et al. Engineering the provitamin A (β-carotene) biosynthetic pathway into (carotenoid-free) rice endosperm. Science 2000; 287(5451): 303-5. [http://dx.doi.org/10.1126/science.287.5451.303] [PMID: 10634784] ]. Second, the blocked strategy silences a biosynthetic step immediately downstream of the compound whose level is to be increased. Higher lycopene accumulation in tomato is a result of silenced lycopene β-cyclases [41Diretto G, Tavazza R, Welsch R, et al. Metabolic engineering of potato tuber carotenoids through tuber-specific silencing of lycopene epsilon cyclase. BMC Plant Biol 2006; 6: 13. [http://dx.doi.org/10.1186/1471-2229-6-13] [PMID: 16800876] ]. The third strategy, termed sink engineering, regulates carotenoid storage structures to stably store carotenoids [42Diretto G, Al-Babili S, Tavazza R, et al. Transcriptional-metabolic networks in β-carotene-enriched potato tubers: the long and winding road to the golden phenotype. Plant Physiol 2010; 154(2): 899-912. [http://dx.doi.org/10.1104/pp.110.159368] [PMID: 20671108] ]. Table 1 summarizes outcomes on transgenic pVA production in the select crops. Wheat (Triticum spp.) is a major cereal crop in many parts of the world [37Cunningham FX Jr, Gantt E. Genes and enzymes of carotenoid biosynthesis in plants. Annu Rev Plant Physiol Plant Mol Biol 1998; 49(1): 557-83. [http://dx.doi.org/10.1146/annurev.arplant.49.1.557] [PMID: 15012246] ] supplying the greatest amount of calories [21Wang C, Zeng J, Li Y, et al. Enrichment of provitamin A content in wheat (Triticum aestivum L.) by introduction of the bacterial carotenoid biosynthetic genes CrtB and CrtI. J Exp Bot 2014; 65(9): 2545-56. [http://dx.doi.org/10.1093/jxb/eru138] [PMID: 24692648] ]. Durum wheat (T. turgidum) for pasta and couscous was selected for increased yellow pigments [44Qin X, Fischer K, Yu S, Dubcovsky J, Tian L. Distinct expression and function of carotenoid metabolic genes and homoeologs in developing wheat grains. BMC Plant Biol 2016; 16(1): 155. [http://dx.doi.org/10.1186/s12870-016-0848-7] [PMID: 27405473] ] of which the main components are carotenoids [37Cunningham FX Jr, Gantt E. Genes and enzymes of carotenoid biosynthesis in plants. Annu Rev Plant Physiol Plant Mol Biol 1998; 49(1): 557-83. [http://dx.doi.org/10.1146/annurev.arplant.49.1.557] [PMID: 15012246] ]. However, the major carotenoid in durum wheat is lutein, non-pVA carotenoid. Moreover, 94% of wheat currently grown is bread wheat (T. aestivum) which was selected for white flour with little pVA carotenoid [44Qin X, Fischer K, Yu S, Dubcovsky J, Tian L. Distinct expression and function of carotenoid metabolic genes and homoeologs in developing wheat grains. BMC Plant Biol 2016; 16(1): 155. Cong et al. (2009) showed bread wheat grains could produce high levels of carotenoids by introducing the maize PSY1 and bacterial carotene desaturases (CrtI) genes [37Cunningham FX Jr, Gantt E. Genes and enzymes of carotenoid biosynthesis in plants. Annu Rev Plant Physiol Plant Mol Biol 1998; 49(1): 557-83. [http://dx.doi.org/10.1146/annurev.arplant.49.1.557] [PMID: 15012246] ]. Their transgenic wheat endosperm increased carotenoid contents 10.8 folds compared with the non-transgenic counterpart [37Cunningham FX Jr, Gantt E. Genes and enzymes of carotenoid biosynthesis in plants. Annu Rev Plant Physiol Plant Mol Biol 1998; 49(1): 557-83. [http://dx.doi.org/10.1146/annurev.arplant.49.1.557] [PMID: 15012246] ]. To further increase carotenoids and investigate transgene effects, Cong et al. (2014) introduced the bacterial phytoene synthase gene (CrtB) instead of the maize PSY1 gene into bread wheat, Bobwhite [21Wang C, Zeng J, Li Y, et al. Enrichment of provitamin A content in wheat (Triticum aestivum L.) by introduction of the bacterial carotenoid biosynthetic genes CrtB and CrtI. J Exp Bot 2014; 65(9): 2545-56. [http://dx.doi.org/10.1093/jxb/eru138] [PMID: 24692648] ]. Expression of either CrtB or CrtI alone slightly increased carotenoid contents while co-expression of both genes in transgenic grain significantly enhanced total carotenoids up to 8 folds, pVA contents as a sum of α-, β-carotenes, and β-cryptoxanthin up to 76 folds, and β-carotene alone up to 65 folds [21Wang C, Zeng J, Li Y, et al. Enrichment of provitamin A content in wheat (Triticum aestivum L.) by introduction of the bacterial carotenoid biosynthetic genes CrtB and CrtI. J Exp Bot 2014; 65(9): 2545-56. [http://dx.doi.org/10.1093/jxb/eru138] [PMID: 24692648] ]. Zeng et al. (2015) altered wheat β-carotene with lycopene β-cyclase gene (LCYb) [43Zeng J, Wang C, Chen X, et al. The lycopene β-cyclase plays a significant role in provitamin A biosynthesis in wheat endosperm. BMC Plant Biol 2015; 15: 112. [http://dx.doi.org/10.1186/s12870-015-0514-5] [PMID: 25943989] ]. Lycopene cyclization is the first branch point for the two competing carotenes, α- and β-carotene (Fig. 2 ). 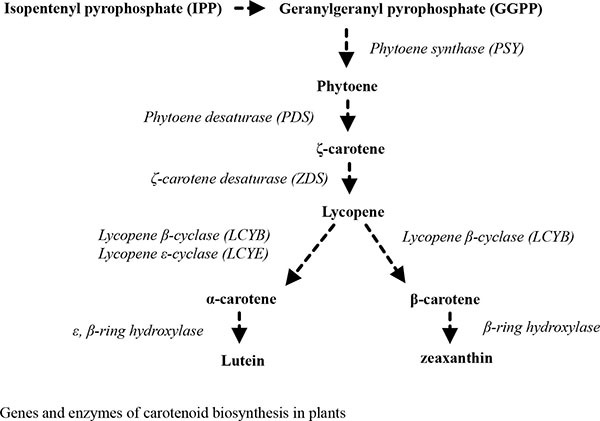 And LCYb is a key enzyme catalyzing β-carotene biosynthesis while lycopene ε-cyclase (LCYe) for α-carotene. A wheat LCYb (TaLCYb) was cloned from bread wheat, Chinese Spring, and silencing the gene decreased β-carotene [43Zeng J, Wang C, Chen X, et al. The lycopene β-cyclase plays a significant role in provitamin A biosynthesis in wheat endosperm. BMC Plant Biol 2015; 15: 112. [http://dx.doi.org/10.1186/s12870-015-0514-5] [PMID: 25943989] ]. Also, carotenoid cleavage dioxygenases (CCDs) modified β-carotene contents by converting β-carotene into smaller molecules called apocarotenoids. Qin et al. (2016) cloned two wheat CCDs genes and characterized them with β-carotene synthesis; CCD1 homoeologs contributed to the degradation of β-carotene by cleaving it [44Qin X, Fischer K, Yu S, Dubcovsky J, Tian L. Distinct expression and function of carotenoid metabolic genes and homoeologs in developing wheat grains. BMC Plant Biol 2016; 16(1): 155. Outcomes of transgenic provitamin A (pVA) production or enhancement in wheat, maize and potato are summarized; genes, varieties, and changes in pVA levels are presented. Maize (Zea mays) is a dominant subsistence crop in many parts of Sub-Saharan Africa [45Aluru M, Xu Y, Guo R, et al. Generation of transgenic maize with enhanced provitamin A content. J Exp Bot 2008; 59(13): 3551-62. [http://dx.doi.org/10.1093/jxb/ern212] [PMID: 18723758] ]. While β-carotene is low in maize kernels [52Wong JC, Lambert RJ, Wurtzel ET, Rocheford TR. QTL and candidate genes phytoene synthase and ζ-carotene desaturase associated with the accumulation of carotenoids in maize. Theor Appl Genet 2004; 108(2): 349-59. [http://dx.doi.org/10.1007/s00122-003-1436-4] [PMID: 14523521] ], maize displays a genetic variation in carotenoid contents [53Harjes CE, Rocheford TR, Bai L, et al. Natural genetic variation in lycopene epsilon cyclase tapped for maize biofortification. Science 2008; 319(5861): 330-3. [http://dx.doi.org/10.1126/science.1150255] [PMID: 18202289] ]. In yellow kernels, β-carotene ranges from 0.01 to 4.7 mg g-1 [54Muthusamy V, Hossain F, Thirunavukkarasu N, et al. Development of β-carotene rich maize hybrids through marker-assisted introgression of β-carotene hydroxylase allele. PLoS One 2014; 9(12): e113583. [http://dx.doi.org/10.1371/journal.pone.0113583] [PMID: 25486271] ] although most yellow varieties consumed contain only 0.5 to 1.5 mg g-1 [53Harjes CE, Rocheford TR, Bai L, et al. Natural genetic variation in lycopene epsilon cyclase tapped for maize biofortification. Science 2008; 319(5861): 330-3. [http://dx.doi.org/10.1126/science.1150255] [PMID: 18202289] ]. Additionally, utilization of yellow maize for livestock feed hinders human consumption in parts of Southern Africa where white maize, lacking pVA, is preferred [55Muzhingi T, Gadaga TH, Siwela AH, Grusak MA, Russell RM, Tang G. Yellow maize with high β-carotene is an effective source of vitamin A in healthy Zimbabwean men. Am J Clin Nutr 2011; 94(2): 510-9. Aluru et al. (2008) employed bacterial CrtB and CrtI genes for carotenoid production in white maize, Hi-II which contains undetectable amounts of carotenoids [45Aluru M, Xu Y, Guo R, et al. Generation of transgenic maize with enhanced provitamin A content. J Exp Bot 2008; 59(13): 3551-62. [http://dx.doi.org/10.1093/jxb/ern212] [PMID: 18723758] ]. The transgenic lines expressing the two genes increased β-carotene 7-13 folds compared to the control [45Aluru M, Xu Y, Guo R, et al. Generation of transgenic maize with enhanced provitamin A content. J Exp Bot 2008; 59(13): 3551-62. [http://dx.doi.org/10.1093/jxb/ern212] [PMID: 18723758] ]. Zhu et al. (2008) correlated specific transgenes’ expressions with carotenoid profiles in white maize, M37W which lacks endosperm carotenoids [46Zhu C, Naqvi S, Breitenbach J, Sandmann G, Christou P, Capell T. Combinatorial genetic transformation generates a library of metabolic phenotypes for the carotenoid pathway in maize. Proc Natl Acad Sci USA 2008; 105(47): 18232-7. [http://dx.doi.org/10.1073/pnas.0809737105] [PMID: 19011084] ]. They introduced five carotenogenic genes in M37W, and identified transgenic lines carrying combinations of the five transgenes. Of the combinations, ones carrying the maize PSY1 and Pantoea ananatis CrtI produced orange-red phenotypes with high pVA carotenoids [46Zhu C, Naqvi S, Breitenbach J, Sandmann G, Christou P, Capell T. Combinatorial genetic transformation generates a library of metabolic phenotypes for the carotenoid pathway in maize. Proc Natl Acad Sci USA 2008; 105(47): 18232-7. [http://dx.doi.org/10.1073/pnas.0809737105] [PMID: 19011084] ]. Naqvi et al. (2009) created transgenic maize with three multiple vitamins, pVA, ascorbate and folate, by simultaneously modifying three separate metabolic pathways [47Naqvi S, Zhu C, Farre G, et al. Transgenic multivitamin corn through biofortification of endosperm with three vitamins representing three distinct metabolic pathways. Proc Natl Acad Sci USA 2009; 106(19): 7762-7. [http://dx.doi.org/10.1073/pnas.0901412106] [PMID: 19416835] ]. This transgenic maize is expected to combat multiple micronutrient deficiencies. Expression of the maize PSY1 and CrtI increased β-carotene 169 folds in transgenic maize, and this level of β-carotene could provide its full recommended daily intake with a typical portion of 100-200 g of maize grain [47Naqvi S, Zhu C, Farre G, et al. Transgenic multivitamin corn through biofortification of endosperm with three vitamins representing three distinct metabolic pathways. Proc Natl Acad Sci USA 2009; 106(19): 7762-7. [http://dx.doi.org/10.1073/pnas.0901412106] [PMID: 19416835] ]. In 2014, the European Commission granted consent for experimental release of the transgenic maize (Carolight TM) in Spain to measure its agronomic and other characteristics [56 European Commission. Notification report: European Commission; 2014 May [updated 2016 Oct]. Internet. Available from: http://gmoinfo. jrc.ec.europa.eu/gmp_report.aspx?CurNot=B/ES/14/04]. Recently, Zanga et al. (2016) reported Carolight TM was indistinguishable from its near isogenic line for agronomic performance including yield [57Zanga D, Capell T, Slafer GA, Christou P, Savin R. A carotenogenic mini-pathway introduced into white corn does not affect development or agronomic performance. Sci Rep 2016; 6: 38288. [http://dx.doi.org/10.1038/srep38288] [PMID: 27922071] ]. Rice has made similar progress with iron and zinc; Trijatmiko et al. (2016) succeeded in attaining 30% Estimated Average Requirement of iron and zinc in transgenic indica rice [58Trijatmiko KR, Dueñas C, Tsakirpaloglou N, et al. Biofortified indica rice attains iron and zinc nutrition dietary targets in the field. Sci Rep 2016; 6: 19792. [http://dx.doi.org/10.1038/srep19792] [PMID: 26806528] ]. Rice thus can combine enhanced iron, zinc and pVA to complement multi-micronutrients interventions [58Trijatmiko KR, Dueñas C, Tsakirpaloglou N, et al. Biofortified indica rice attains iron and zinc nutrition dietary targets in the field. Sci Rep 2016; 6: 19792. Potato (Solanum tuberosum) comes after wheat, rice and maize as a significant energy source [41Diretto G, Tavazza R, Welsch R, et al. Metabolic engineering of potato tuber carotenoids through tuber-specific silencing of lycopene epsilon cyclase. BMC Plant Biol 2006; 6: 13. [http://dx.doi.org/10.1186/1471-2229-6-13] [PMID: 16800876] ], but cultivated potatoes are low in carotenoids ranging between 0.5 and 2.5 mg g-1 Fresh Weight (FW) [50Diretto G, Al-Babili S, Tavazza R, Papacchioli V, Beyer P, Giuliano G. Metabolic engineering of potato carotenoid content through tuber-specific overexpression of a bacterial mini-pathway. PLoS One 2007 b; 2(4): e350. [http://dx.doi.org/10.1371/journal.pone.0000350] [PMID: 17406674] ]. The main carotenoids are xanthophylls, lutein and violaxanthin, which lack pVA activities, and β-carotene ranges from undetectable to 0.03 mg g-1 FW. Some wild potato species reach high levels of carotenoids, but low in β-carotene [50Diretto G, Al-Babili S, Tavazza R, Papacchioli V, Beyer P, Giuliano G. Metabolic engineering of potato carotenoid content through tuber-specific overexpression of a bacterial mini-pathway. PLoS One 2007 b; 2(4): e350. Ducreux et al. (2005) enhanced carotenoids with the CrtB in a potato cultivar, Desiree [48Ducreux LJ, Morris WL, Hedley PE, et al. Metabolic engineering of high carotenoid potato tubers containing enhanced levels of β-carotene and lutein. J Exp Bot 2005; 56(409): 81-9. [PMID: 15533882] ]. The transgenic lines increased total tuber carotenoids up to 6.3 folds, and reached 11 lg g-1 DW in β-carotene compared to the negligible amount in the control [48Ducreux LJ, Morris WL, Hedley PE, et al. Metabolic engineering of high carotenoid potato tubers containing enhanced levels of β-carotene and lutein. J Exp Bot 2005; 56(409): 81-9. [PMID: 15533882] ]. Diretto et al. (2006) increased β-carotene up to 14 folds in transgenic potato by silencing the LCYe gene, which favorably altered a proportion of α- to β-carotene [41Diretto G, Tavazza R, Welsch R, et al. Metabolic engineering of potato tuber carotenoids through tuber-specific silencing of lycopene epsilon cyclase. BMC Plant Biol 2006; 6: 13. [http://dx.doi.org/10.1186/1471-2229-6-13] [PMID: 16800876] ]. Diretto et al. (2007 a) adopted a different strategy to further increase β-carotene [49Diretto G, Welsch R, Tavazza R, et al. Silencing of beta-carotene hydroxylase increases total carotenoid and beta-carotene levels in potato tubers. BMC Plant Biol 2007; 7: 11. [http://dx.doi.org/10.1186/1471-2229-7-11] [PMID: 17335571] ]. They silenced genes encoding a non-heme β-carotene hydroxylase (CHY) to prevent β-carotene from converting into zeaxanthin, the immediate product of CHY. Their CHY-silenced tubers increased β-carotene up to 38 folds and total carotenoids up to 4.5 folds with zeaxanthin decreased [49Diretto G, Welsch R, Tavazza R, et al. Silencing of beta-carotene hydroxylase increases total carotenoid and beta-carotene levels in potato tubers. BMC Plant Biol 2007; 7: 11. [http://dx.doi.org/10.1186/1471-2229-7-11] [PMID: 17335571] ]. Diretto et al. (2007 b) introduced a bacterial-origin pathway with CrtB, CrtI and CrtY (lycopene beta-cyclase) genes in potato to direct β-carotene synthesis from GGPP [50Diretto G, Al-Babili S, Tavazza R, Papacchioli V, Beyer P, Giuliano G. Metabolic engineering of potato carotenoid content through tuber-specific overexpression of a bacterial mini-pathway. PLoS One 2007 b; 2(4): e350. [http://dx.doi.org/10.1371/journal.pone.0000350] [PMID: 17406674] ]. Expression of all three genes increased β-carotene up to 3600 folds in a deep yellow phenotype, which has been the highest increase reported in all pVA biofortified crops. With an assumed β-carotene to retinol conversion ratio 6:1 and 250g of potato consumption, they can provide 50% of VA Recommended Dietary Allowance [50Diretto G, Al-Babili S, Tavazza R, Papacchioli V, Beyer P, Giuliano G. Metabolic engineering of potato carotenoid content through tuber-specific overexpression of a bacterial mini-pathway. PLoS One 2007 b; 2(4): e350. Bananas (Musa spp.) are perennial monocots that are vegetatively propagated [59Buah S, Mlalazi B, Khanna H, Dale JL, Mortimer CL. The quest for golden bananas: Investigating carotenoid regulation in a Fei group Musa cultivar. J Agric Food Chem 2016; 64(16): 3176-85. [http://dx.doi.org/10.1021/acs.jafc.5b05740] [PMID: 27041343] ]. Natural variations in banana pVA contents contribute to the fruit color variation from white to dark orange. A major banana cultivar, Cavendish (M. acuminata) is low in β-carotene, 0.72 lg g-1 FW while noncommercial Asupina (Fei group Musa cultivar) with orange pulp contains high β-carotene, 14.5 lg g-1 FW. However, the fact that the majority of banana cultivars are sterile triploids challenges their conventional breeding. Therefore, genetic modification within the genetic variation in Musa spp., or cisgenics, can be a viable option [60Mlalazi B, Welsch R, Namanya P, et al. Isolation and functional characterisation of banana phytoene synthase genes as potential cisgenes. Planta 2012; 236(5): 1585-98. Mlalazi et al. (2012) characterized banana PSY genes and proposed at least two PSY paralogs, PSY1 and PSY2a are present in Cavendish and Asupina [60Mlalazi B, Welsch R, Namanya P, et al. Isolation and functional characterisation of banana phytoene synthase genes as potential cisgenes. Planta 2012; 236(5): 1585-98. [http://dx.doi.org/10.1007/s00425-012-1717-8] [PMID: 22843244] ]. The Asupina PSY enzyme exhibited 2-fold higher enzymatic activity than that of Cavendish, and β-carotene contents in Asupina and Cavendish differed by at least an order of magnitude. Thus, utilization of Asupina PSY gene could increase β-carotene in widely consumed banana cultivars, facilitate GMO regulatory approval, and improve consumer acceptance of pVA bananas [60Mlalazi B, Welsch R, Namanya P, et al. Isolation and functional characterisation of banana phytoene synthase genes as potential cisgenes. Planta 2012; 236(5): 1585-98. [http://dx.doi.org/10.1007/s00425-012-1717-8] [PMID: 22843244] ]. Buah et al. (2016) further identified key differences between the two bananas; expression of CCD4 in Cavendish which decreased β-carotene in Cavendish, and conversion of amyloplasts to chromoplasts in Asupina which increased β-carotene in Auspina [59Buah S, Mlalazi B, Khanna H, Dale JL, Mortimer CL. The quest for golden bananas: Investigating carotenoid regulation in a Fei group Musa cultivar. J Agric Food Chem 2016; 64(16): 3176-85. [http://dx.doi.org/10.1021/acs.jafc.5b05740] [PMID: 27041343] ]. As in wheat CCD enzymes, expression of CCD4 gene cleaved more Cavendish β-carotenes to form apocarotenoids. Chromoplasts play critical roles in β-carotene storage under the Orange gene (Or) control, which a later section discusses. Therefore, both greater CCD4 expression and little presence of chromoplasts in Cavendish attribute to its low β-carotene [59Buah S, Mlalazi B, Khanna H, Dale JL, Mortimer CL. The quest for golden bananas: Investigating carotenoid regulation in a Fei group Musa cultivar. J Agric Food Chem 2016; 64(16): 3176-85. Harvested crops are consumed and stored until the next harvest. Degradation of pVA carotenoids during storage is problematic for VAD-afflicted populations. Moreover, β-carotene is considerably susceptible to oxidation due to its conjugated double-bond system [61Gayen D, Ali N, Sarkar SN, Datta SK, Datta K. Down-regulation of lipoxygenase gene reduces degradation of carotenoids of golden rice during storage. Planta 2015; 242(1): 353-63. [http://dx.doi.org/10.1007/s00425-015-2314-4] [PMID: 25963517] ]. In high-carotenoid yellow maize lines, up to 56% of carotenoids were lost during a long-term storage and in yellow wheat, up to 48% [51Li L, Yang Y, Xu Q, et al. The Or gene enhances carotenoid accumulation and stability during post-harvest storage of potato tubers. Mol Plant 2012; 5(2): 339-52. [http://dx.doi.org/10.1093/mp/ssr099] [PMID: 22155949] ]. It is equally critical to retain enhanced pVA during crop consumption and storage. Li et al. (2001) investigated a mutant cauliflower Or gene and showed the gene is associated with increases in carotenogenic activity and chromoplasts which sequester large amounts of β-carotene in cauliflower [62Li L, Paolillo DJ, Parthasarathy MV, Dimuzio EM, Garvin DF. A novel gene mutation that confers abnormal patterns of β-carotene accumulation in cauliflower (Brassica oleracea var. botrytis). Plant J 2001; 26(1): 59-67. [http://dx.doi.org/10.1046/j.1365-313x.2001.01008.x] [PMID: 11359610] ]. Currently, the Or gene is the only known gene that triggers differentiation of non-colored plastids into chromoplasts. Chromoplasts accumulate massive amounts of carotenoids by generating carotenoid-lipoprotein sequestering substructures. These substructures stimulate continuous carotenoid biosynthesis and stably store the synthesized products. Chromoplast biogenesis, therefore, can be part of a strategy to enhance pVA contents and their stability [51Li L, Yang Y, Xu Q, et al. The Or gene enhances carotenoid accumulation and stability during post-harvest storage of potato tubers. Mol Plant 2012; 5(2): 339-52. [http://dx.doi.org/10.1093/mp/ssr099] [PMID: 22155949] ]. Expression of the cauliflower Or gene was investigated for carotenoid accumulation and stability in potato [51Li L, Yang Y, Xu Q, et al. The Or gene enhances carotenoid accumulation and stability during post-harvest storage of potato tubers. Mol Plant 2012; 5(2): 339-52. [http://dx.doi.org/10.1093/mp/ssr099] [PMID: 22155949] , 63Lopez AB, Van Eck J, Conlin BJ, Paolillo DJ, ONeill J, Li L. Effect of the cauliflower Or transgene on carotenoid accumulation and chromoplast formation in transgenic potato tubers. J Exp Bot 2008; 59(2): 213-23. [http://dx.doi.org/10.1093/jxb/erm299] [PMID: 18256051] ]. Transgenic potato tubers enhanced carotenoids and β-carotene, and continued accumulating them during long-term cold storage with induced formation of chromoplasts [63Lopez AB, Van Eck J, Conlin BJ, Paolillo DJ, ONeill J, Li L. Effect of the cauliflower Or transgene on carotenoid accumulation and chromoplast formation in transgenic potato tubers. J Exp Bot 2008; 59(2): 213-23. [http://dx.doi.org/10.1093/jxb/erm299] [PMID: 18256051] ]. Thus, the formation of a proper sink structure may enable target crops to promote and stabilize pVA accumulation during crop growth and post-harvest storage [51Li L, Yang Y, Xu Q, et al. The Or gene enhances carotenoid accumulation and stability during post-harvest storage of potato tubers. Mol Plant 2012; 5(2): 339-52. Transgenic pVA enhancement has been successful in various crops. However, a decisive question is whether those transgenic crops will be released in target regions to ease the VAD burden amidst GMO controversies. The next section discusses relevant political issues, and presents a framework to assist in achieving research goals. Domestic regulations determine commercialization of GM crops, and regulatory approval for their cultivation, marketing and usage is country-specific [64de Faria RN, Wieck C. Empirical evidence on the trade impact of asynchronous regulatory approval of new GMO events. Food Policy 2015; 53: 22-32. [http://dx.doi.org/10.1016/j.foodpol.2015.03.005] ]. Thus, governmental stance on GMOs predicts availability of GM crops at market. Genetic modification has been touted as precise, flexible and rapid compared to its alternatives under limited time and resources [65Herring RJ. Opposition to transgenic technologies: ideology, interests and collective action frames. Nat Rev Genet 2008; 9(6): 458-63. [http://dx.doi.org/10.1038/nrg2338] [PMID: 18487989] ], yet there are persistent concerns about safety and trade aspects of GM products, which necessitate regulations [66Nangayo F, Simiyu-Wafukho S, Oikeh SO. Regulatory challenges for GM crops in developing economies: the African experience. Transgenic Res 2014; 23(6): 1049-55. [http://dx.doi.org/10.1007/s11248-014-9805-0] [PMID: 24821674] ]. In formulating national policies of GM products, countries weigh in opportunities and potential risks in social, political and economic contexts. If VAD-afflicted countries prohibit transgenic pVA crops on the ground of their national GMO regulations, investment in multi-stage development, release and marketing of such crops is not viable. Regarding transgenic crop adoption, countries in Sub-Saharan Africa and South Asia are a political mosaic of national stance, from permissive, pre-cautionary to prohibitive [66Nangayo F, Simiyu-Wafukho S, Oikeh SO. Regulatory challenges for GM crops in developing economies: the African experience. Transgenic Res 2014; 23(6): 1049-55. [http://dx.doi.org/10.1007/s11248-014-9805-0] [PMID: 24821674] , 67Balashanmugam S, Subramanian S, Padmavati M. South Asian perspective on institutional mechanism for introduction and import of GM crops. Biotechnol Law Rep 2016; 35(2): 73-9. [http://dx.doi.org/10.1089/blr.2016.29007.skb] ]. Likewise, developmental stages of legislative infrastructure on GM crops vary from established, partially built to virtually non-existent [67Balashanmugam S, Subramanian S, Padmavati M. South Asian perspective on institutional mechanism for introduction and import of GM crops. Biotechnol Law Rep 2016; 35(2): 73-9. [http://dx.doi.org/10.1089/blr.2016.29007.skb] ]. In South Asia, for instance, Bhutan adopted a restrictive GMO-free strategy banning any introduction, release, or research of GMOs while India established federal and state agencies to regulate already commercialized GM crops [67Balashanmugam S, Subramanian S, Padmavati M. South Asian perspective on institutional mechanism for introduction and import of GM crops. Biotechnol Law Rep 2016; 35(2): 73-9. [http://dx.doi.org/10.1089/blr.2016.29007.skb] ]. In sub-Saharan Africa, South Africa among few others is a frontrunner of GM crop adoption and enacted GMO laws in 2000 while Angola prohibits GMOs with no enacted GMO laws [66Nangayo F, Simiyu-Wafukho S, Oikeh SO. Regulatory challenges for GM crops in developing economies: the African experience. Transgenic Res 2014; 23(6): 1049-55. [http://dx.doi.org/10.1007/s11248-014-9805-0] [PMID: 24821674] , 68Mabaya E, Fulton J, Simiyu-Wafukho S, Nang'ayo F. Factors influencing adoption of genetically modified crops in Africa. Dev South Afr 2015; 32(5): 577-91. [http://dx.doi.org/10.1080/0376835X.2015.1044078] ]. Mabaya et al. (2015) identified some key factors affecting GM crop policies in Africa [68Mabaya E, Fulton J, Simiyu-Wafukho S, Nang'ayo F. Factors influencing adoption of genetically modified crops in Africa. Dev South Afr 2015; 32(5): 577-91. [http://dx.doi.org/10.1080/0376835X.2015.1044078] ], which might be applicable to South Asia. First, positions of line ministries are important; the ministry of agriculture tends to favor GM crops whereas the ministry of environment tends to view them as potential threats. Also, the more ministries are involved, the less likely or more slowly GM crops would be adopted due to their conflicting interests. Second, peer country influence is significant because GM crop adoption by one country can trigger repercussions across porous borders. The repercussions include spreading agricultural technology, sharing knowledge-experience, trading unapproved GM products, and unintended environmental contaminations [68Mabaya E, Fulton J, Simiyu-Wafukho S, Nang'ayo F. Factors influencing adoption of genetically modified crops in Africa. Dev South Afr 2015; 32(5): 577-91. [http://dx.doi.org/10.1080/0376835X.2015.1044078] ]. Herrington (2008) indicated that unauthorized transgenic crop planting might be considerable [5Abraham A. Toward a workable biosafety system for regulating genetically modified organisms in Ethiopia: Balancing conservation and competitiveness. GM Crops Food 2013; 4(1): 28-35. [http://dx.doi.org/10.4161/gmcr.24375] [PMID: 23580251] , 65Herring RJ. Opposition to transgenic technologies: ideology, interests and collective action frames. Nat Rev Genet 2008; 9(6): 458-63. [http://dx.doi.org/10.1038/nrg2338] [PMID: 18487989] ]. This partly results from ‘asynchronous approval’ of new GM products; approval of a new GM product does not occur simultaneously across countries [64de Faria RN, Wieck C. Empirical evidence on the trade impact of asynchronous regulatory approval of new GMO events. Food Policy 2015; 53: 22-32. [http://dx.doi.org/10.1016/j.foodpol.2015.03.005] ]. In Sub-Saharan Africa, this concern contributed to creating COMESA or Common Market for Eastern and Southern Africa to guide safe and responsible management of trans-boundary movements of GMOs [69Waithaka M, Belay G, Kyotalimye M, Karembu M. Progress and challenges for implementation of the Common Market for Eastern and Southern Africa policy on biotechnology and biosafety. Front Bioeng Biotechnol 2015; 3: 109. [http://dx.doi.org/10.3389/fbioe.2015.00109] [PMID: 26284243] ]. Third, developmental stages of seed sectors affect GM crop adoption; more matured seed sectors are correlated with more positive attitudes to GM crops. Fourth, advocacy by key political figures and public influence are identified important; the media, often criticized for sensationalism, sway public opinions that in turn influence political decisions. Fifth, food security crisis plays a role in GM crop adoption; with production surplus, there is more reluctance to adopt GM crops whereas under food insecurity they are considered a workable alternative [68Mabaya E, Fulton J, Simiyu-Wafukho S, Nang'ayo F. Factors influencing adoption of genetically modified crops in Africa. Dev South Afr 2015; 32(5): 577-91. In addition to those domestic-oriented factors, external factors influence GM policy differences, one of which is the mixed signal that America and Europe send to market. The American policy stance on GMOs emphasizes product similarities between conventional and GM breeding. This approach is based on the principle of ‘substantial equivalence’, in which GMOs are viewed as comparable to the products of conventional breeding. As such, creating new regulations to oversee GMOs is not necessary [70Schnurr MA, Smyth SJ. Can Genetically Modified Crops Help the Poor?. Options for Canada’s Foreign Policy, Policy Brief No. 12, 2016. Available from: https://www.genomecanada.ca/sites/genomecanada/files/genome_16-136_gps_policybrief_on_gmo_crops_brief_12_e_ web.pdf]. On the other hand, European skepticism about GMOs arises from the precautionary principle, in which GMOs are viewed as fundamentally different from conventional breeding. Thus, GMOs are subject to strict measures for approval, monitoring and liability, influencing policies both in Europe and abroad [70Schnurr MA, Smyth SJ. Can Genetically Modified Crops Help the Poor?. Options for Canada’s Foreign Policy, Policy Brief No. 12, 2016. Available from: https://www.genomecanada.ca/sites/genomecanada/files/genome_16-136_gps_policybrief_on_gmo_crops_brief_12_e_ web.pdf]. Furthermore, the divergent stances on GMOs complicate food aid policies. Responding to the severe drought in 2001 and 2002 in southern Africa, only Swaziland accepted the GM yellow maize as food aid from the World Food Program while Zimbabwe, Mozambique, Lesotho, and Malawi limited or refused it [69Waithaka M, Belay G, Kyotalimye M, Karembu M. Progress and challenges for implementation of the Common Market for Eastern and Southern Africa policy on biotechnology and biosafety. Front Bioeng Biotechnol 2015; 3: 109. Given those complicated circumstances, utilization of transgenic pVA crops hinges on political dynamics in target countries since the current GMO policies do not discriminate trait characteristics whether they are disease resistance, or micronutrient biofortification. Transgenic biofortified crops should be more carefully viewed in that they serve different purposes and benefit different populations. For this reason, the reductionist’s viewpoint on GMOs, either for or against, may not be the best way to see transgenic biofortification. Overall, the segmented GMO policies across the target regions require cautious considerations prior to, during and post development of transgenic pVA crops. The framework thus intends to provide potential influencers for transgenic pVA crop development (Table 2). Although other influencers can enter and interplay in specific contexts, the framework may offer important factors to consider, probably applicable to other transgenic micronutrient biofortification. Framework for transgenic pVA crop development during different development stages with potential influencers. In sum, political climates and public attitudes towards GMOs in target countries should be realistically evaluated. Their different political stance and attitude would enable or disable and support or hinder transgenic pVA crop development and adoption to combat VAD. As such, consultation and partnership with line ministries should guide initial research decisions. Notably, patterns of target crop production, consumption and cultural practices should be assessed. Wheat, maize, potato and banana are global commodities but this does not guarantee that specific target populations readily adopt them due to different food-related cultures, social norms or economies. Developers may consider whether a target population grows a target crop for subsistence or income-generation, the population rejects the transgenic crop from any changes in its attribute, or growing the crop involves additional costs compared to the conventional counterpart, which is related to the Intellectual Property Rights (IPRs) to utilize the pVA trait. The IPR arrangement affects affordability of a pVA crop, allowing it to be free-of-charge under a humanitarian aid or fee-based under a market principle. As Zanga et al. (2016) recommended, developers should allocate resources for IPRs investigations and partnership-building with patent licensors to minimize future conflicts [71Zanga D, Capell T, Zhu C, Christou P, Thangaraj H. Freedom to operate analysis of a transgenic multivitamin corn variety. Plant Biotechnol J 2016; 14(5): 1225-40. [http://dx.doi.org/10.1111/pbi.12488] [PMID: 26471770] ]. Although often overlooked, efficacy of existing VAD interventions in target regions must be factored in; when the current interventions work well within the healthcare system with low costs, approval of transgenic pVA crops is not a political priority. Presence of transparent communication channels is required to disseminate scientifically-sound information, and discriminate against misleading information, either positive or negative, on transgenic pVA crops. These channels promote or impede informing stakeholders of benefits and risks for fair judgment, and proactive, not reactive, GMO policy modifications. Finally, when target populations utilize transgenic pVA crops, quality monitoring and health evaluation should be hand-in-hand to ensure a claimed level of pVA and its efficacy for health effects, and to scale up pVA crop programs. Humanitarian efforts to release pVA crops should not be hindered for political reasons when a safe means is available with proven benefits. Yet, without careful proactive strategies to factor those major influencers in, however effective to combat VAD, transgenic pVA crops would unlikely reach to market shelves from research facilities under political challenges. The author thank Steven E. Ullrich and Nuan Wen at Department of Crop and Soil Sciences, Washington State University, Pullman, WA, USA, and Sheldon Krimsky at Department of Urban and Environmental Policy and Planning, Tufts University, Medford, MA, USA for their valuable comments on the manuscript. Stevens GA, Bennett JE, Hennocq Q, et al. Trends and mortality effects of vitamin A deficiency in children in 138 low-income and middle-income countries between 1991 and 2013: A pooled analysis of population-based surveys. Lancet Glob Health 2015; 3(9): e528-36. West K Jr. Vitamin A deficiency: Health, survival, and vision. New York: Oxford University Press 1996. Abraham A. Toward a workable biosafety system for regulating genetically modified organisms in Ethiopia: Balancing conservation and competitiveness. GM Crops Food 2013; 4(1): 28-35. Mbabazi R. Molecular characterisation and carotenoid quantification of pro-vitamin A biofortified genetically modified bananas in Uganda 2015. Vitamin A Supplementation: A Statistical Snapshot. New York: United Nations Children's Fund 2016. Kuong K, Laillou A, Chea C, Chamnan C, Berger J, Wieringa FT. Stability of vitamin A, iron and zinc in fortified rice during storage and its impact on future national standards and ProgramsCase study in Cambodia. Nutrients 2016; 8(1): 51. Dary O, Mora JO. Food fortification to reduce vitamin A deficiency: International vitamin A consultative group recommendations. J Nutr 2002; 132(9 Suppl): 2927S-33S. Underwood BA. Dietary approaches to the control of vitamin A deficiency: An introduction and overview. Food Nutr Bull 2000; 21(2): 117-23. Tanumihardjo SA, Gannon B, Kaliwile C. Controversy Regarding Widespread Vitamin A Fortification in Africa and Asia. Adv Nutr Int Rev J 2016; 7(1): 5A-A. Arroyave G, Mejía LA, Aguilar JR. The effect of vitamin A fortification of sugar on the serum vitamin A levels of preschool Guatemalan children: A longitudinal evaluation. Am J Clin Nutr 1981; 34(1): 41-9. Pineda O. Fortification of sugar with vitamin A. Food Nutr Bull 1998; 19(2): 131-6. Garcia Casal MN, Peñ Rosas JP, Pachón H, De Regil LM, Centeno Tablante E, Flores Urrutia MC. Staple crops biofortified with increased micronutrient content: effects on vitamin and mineral status, as well as health and cognitive function in the general population. Cochrane Database of Syst Rev; Cochrane Libr 2016; 8: CD012311. Souganidis E, Laillou A, Leyvraz M, Moench-Pfanner R. A comparison of retinyl palmitate and red palm oil β-carotene as strategies to address Vitamin A deficiency. Nutrients 2013; 5(8): 3257-71. Masanja H, Smith ER, Muhihi A, et al. Effect of neonatal vitamin A supplementation on mortality in infants in Tanzania (Neovita): A randomised, double-blind, placebo-controlled trial. Lancet 2015; 385(9975): 1324-32. World Health Organization Guideline: Vitamin A supplementation in infants and children 6-59 months of age Geneva: World Health Organization. 2011. Report No. : 9241501766. Pignitter M, Hernler N, Zaunschirm M, et al. Evaluation of palm oil as a suitable vegetable oil for vitamin A fortification programs. Nutrients 2016; 8(6): 378. Pignitter M, Dumhart B, Gartner S, et al. Vitamin A is rapidly degraded in retinyl palmitate-fortified soybean oil stored under household conditions. J Agric Food Chem 2014; 62(30): 7559-66. Haskell MJ. The challenge to reach nutritional adequacy for vitamin A: β-carotene bioavailability and conversion-evidence in humans. Am J Clin Nutr 2012; 96(5): 1193S-203S. Wang C, Zeng J, Li Y, et al. Enrichment of provitamin A content in wheat (Triticum aestivum L.) by introduction of the bacterial carotenoid biosynthetic genes CrtB and CrtI. J Exp Bot 2014; 65(9): 2545-56. Bechoff A, Dhuique-Mayer C. Factors influencing micronutrient bioavailability in biofortified crops. Ann N Y Acad Sci 2017; 1390(1): 74-87. Johns Hopkins Bloomberg School of Public Health The Story of Vitamin A: Johns Hopkins Bloomberg School of Public Health 2003. [updated 2016 Sep. Internet]. Available from: http://www.jhsph.edu/news/stories/2003/sommer-vita.html. Sommer A, Tarwotjo I, Hussaini G, Susanto D. Increased mortality in children with mild vitamin A deficiency. Lancet 1983; 2(8350): 585-8. Sommer A, Tarwotjo I, Djunaedi E, et al. Impact of vitamin A supplementation on childhood mortality. A randomised controlled community trial. Lancet 1986; 1(8491): 1169-73. Solomons NW. Will universal periodic vitamin A supplementation ever reach retirement age? Food Nutr Bull 2014; 35(2): 200-2. Imdad A, Herzer K, Mayo-Wilson E, Yakoob MY, Bhutta ZA. Vitamin A supplementation for preventing morbidity and mortality in children from 6 months to 5 years of age. Cochrane Database Syst Rev 2010; (12): CD008524. Awasthi S, Peto R, Read S, Clark S, Pande V, Bundy D. Vitamin A supplementation every 6 months with retinol in 1 million pre-school children in north India: DEVTA, a cluster-randomised trial. Lancet 2013; 381(9876): 1469-77. Organization WH. Guideline: Neonatal vitamin A supplementation. Geneva: World Health Organization 2011. Edmond KM, Newton S, Shannon C, et al. Effect of early neonatal vitamin A supplementation on mortality during infancy in Ghana (Neovita): A randomised, double-blind, placebo-controlled trial. Lancet 2015; 385(9975): 1315-23. Mazumder S, Taneja S, Bhatia K, et al. Efficacy of early neonatal supplementation with vitamin A to reduce mortality in infancy in Haryana, India (Neovita): A randomised, double-blind, placebo-controlled trial. Lancet 2015; 385(9975): 1333-42. Mason J, Greiner T, Shrimpton R, Sanders D, Yukich J. Vitamin A policies need rethinking. Int J Epidemiol 2015; 44(1): 283-92. Greiner T. Vitamin A: Moving the food-based approach forward. FAO and WHO 2013. HarvestPlus HarvestPlus Crop Strategies: HarvestPlus leads a global effort 2016. Available from: http://www.harvestplus.org/sites/default/ files/HarvestPlus_CropStrategies_Brochure_April2015.pdf. Stein AJ, Sachdev HP, Qaim M. Potential impact and cost-effectiveness of Golden Rice. Nat Biotechnol 2006; 24(10): 1200-1. Cunningham FX Jr, Gantt E. Genes and enzymes of carotenoid biosynthesis in plants. Annu Rev Plant Physiol Plant Mol Biol 1998; 49(1): 557-83. Cong L, Wang C, Chen L, Liu H, Yang G, He G. Expression of phytoene synthase1 and carotene desaturase crtI genes result in an increase in the total carotenoids content in transgenic elite wheat (Triticum aestivum L.). J Agric Food Chem 2009; 57(18): 8652-60. Al-Babili S, Beyer P. Golden Ricefive years on the roadfive years to go? Trends Plant Sci 2005; 10(12): 565-73. Ye X, Al-Babili S, Klöti A, et al. Engineering the provitamin A (β-carotene) biosynthetic pathway into (carotenoid-free) rice endosperm. Science 2000; 287(5451): 303-5. Diretto G, Tavazza R, Welsch R, et al. Metabolic engineering of potato tuber carotenoids through tuber-specific silencing of lycopene epsilon cyclase. BMC Plant Biol 2006; 6: 13. Diretto G, Al-Babili S, Tavazza R, et al. Transcriptional-metabolic networks in β-carotene-enriched potato tubers: the long and winding road to the golden phenotype. Plant Physiol 2010; 154(2): 899-912. Zeng J, Wang C, Chen X, et al. The lycopene β-cyclase plays a significant role in provitamin A biosynthesis in wheat endosperm. BMC Plant Biol 2015; 15: 112. Qin X, Fischer K, Yu S, Dubcovsky J, Tian L. Distinct expression and function of carotenoid metabolic genes and homoeologs in developing wheat grains. BMC Plant Biol 2016; 16(1): 155. Aluru M, Xu Y, Guo R, et al. Generation of transgenic maize with enhanced provitamin A content. J Exp Bot 2008; 59(13): 3551-62. Zhu C, Naqvi S, Breitenbach J, Sandmann G, Christou P, Capell T. Combinatorial genetic transformation generates a library of metabolic phenotypes for the carotenoid pathway in maize. Proc Natl Acad Sci USA 2008; 105(47): 18232-7. Naqvi S, Zhu C, Farre G, et al. Transgenic multivitamin corn through biofortification of endosperm with three vitamins representing three distinct metabolic pathways. Proc Natl Acad Sci USA 2009; 106(19): 7762-7. Ducreux LJ, Morris WL, Hedley PE, et al. Metabolic engineering of high carotenoid potato tubers containing enhanced levels of β-carotene and lutein. J Exp Bot 2005; 56(409): 81-9. Diretto G, Welsch R, Tavazza R, et al. Silencing of beta-carotene hydroxylase increases total carotenoid and beta-carotene levels in potato tubers. BMC Plant Biol 2007; 7: 11. Diretto G, Al-Babili S, Tavazza R, Papacchioli V, Beyer P, Giuliano G. Metabolic engineering of potato carotenoid content through tuber-specific overexpression of a bacterial mini-pathway. PLoS One 2007 b; 2(4): e350. Li L, Yang Y, Xu Q, et al. The Or gene enhances carotenoid accumulation and stability during post-harvest storage of potato tubers. Mol Plant 2012; 5(2): 339-52. Wong JC, Lambert RJ, Wurtzel ET, Rocheford TR. QTL and candidate genes phytoene synthase and ζ-carotene desaturase associated with the accumulation of carotenoids in maize. Theor Appl Genet 2004; 108(2): 349-59. Harjes CE, Rocheford TR, Bai L, et al. Natural genetic variation in lycopene epsilon cyclase tapped for maize biofortification. Science 2008; 319(5861): 330-3. Muthusamy V, Hossain F, Thirunavukkarasu N, et al. Development of β-carotene rich maize hybrids through marker-assisted introgression of β-carotene hydroxylase allele. PLoS One 2014; 9(12): e113583. Muzhingi T, Gadaga TH, Siwela AH, Grusak MA, Russell RM, Tang G. Yellow maize with high β-carotene is an effective source of vitamin A in healthy Zimbabwean men. Am J Clin Nutr 2011; 94(2): 510-9. Zanga D, Capell T, Slafer GA, Christou P, Savin R. A carotenogenic mini-pathway introduced into white corn does not affect development or agronomic performance. Sci Rep 2016; 6: 38288. Trijatmiko KR, Dueñas C, Tsakirpaloglou N, et al. Biofortified indica rice attains iron and zinc nutrition dietary targets in the field. Sci Rep 2016; 6: 19792. Buah S, Mlalazi B, Khanna H, Dale JL, Mortimer CL. The quest for golden bananas: Investigating carotenoid regulation in a Fei group Musa cultivar. J Agric Food Chem 2016; 64(16): 3176-85. Mlalazi B, Welsch R, Namanya P, et al. Isolation and functional characterisation of banana phytoene synthase genes as potential cisgenes. Planta 2012; 236(5): 1585-98. Gayen D, Ali N, Sarkar SN, Datta SK, Datta K. Down-regulation of lipoxygenase gene reduces degradation of carotenoids of golden rice during storage. Planta 2015; 242(1): 353-63. Li L, Paolillo DJ, Parthasarathy MV, Dimuzio EM, Garvin DF. A novel gene mutation that confers abnormal patterns of β-carotene accumulation in cauliflower (Brassica oleracea var. botrytis). Plant J 2001; 26(1): 59-67. Lopez AB, Van Eck J, Conlin BJ, Paolillo DJ, ONeill J, Li L. Effect of the cauliflower Or transgene on carotenoid accumulation and chromoplast formation in transgenic potato tubers. J Exp Bot 2008; 59(2): 213-23.
 de Faria RN, Wieck C. Empirical evidence on the trade impact of asynchronous regulatory approval of new GMO events. Food Policy 2015; 53: 22-32. Herring RJ. Opposition to transgenic technologies: ideology, interests and collective action frames. Nat Rev Genet 2008; 9(6): 458-63. Nangayo F, Simiyu-Wafukho S, Oikeh SO. Regulatory challenges for GM crops in developing economies: the African experience. Transgenic Res 2014; 23(6): 1049-55. Balashanmugam S, Subramanian S, Padmavati M. South Asian perspective on institutional mechanism for introduction and import of GM crops. Biotechnol Law Rep 2016; 35(2): 73-9. Mabaya E, Fulton J, Simiyu-Wafukho S, Nang'ayo F. Factors influencing adoption of genetically modified crops in Africa. Dev South Afr 2015; 32(5): 577-91. Waithaka M, Belay G, Kyotalimye M, Karembu M. Progress and challenges for implementation of the Common Market for Eastern and Southern Africa policy on biotechnology and biosafety. Front Bioeng Biotechnol 2015; 3: 109. Zanga D, Capell T, Zhu C, Christou P, Thangaraj H. Freedom to operate analysis of a transgenic multivitamin corn variety. Plant Biotechnol J 2016; 14(5): 1225-40.